Midwest includes 12 states of North Central United States. This region is home to more than 60 million people. The Midwest is covered by forests, grasslands, the Great Lakes and rivers. Three major river systems of the region are Ohio, Missouri and Mississippi River System. The average air temperature in the Midwest has increased. Northern areas are the most affected by this temperature increase. The eastern part of the region gets the highest precipitation and western part gets the least. Heavy downpours are very common in this region. In the Midwest, climate change is affecting human health in a negative way and creating new health challenges. Heat stress is continuously increasing and resulting in continuous rises in temperatures and humidity. Over the last 60 years, major heat waves became more frequent in this region. The Great Lakes are a major source of drinking water in Midwestern states. Warming water is encouraging the growth of blue-green and toxic algae that results in reduced water quality. Change is the climate is also affecting the agriculture and ecosystems in the Midwest negatively by increasing carbon dioxide levels. Over the last century, extreme rainfall and floods have become very common in the Midwest region. Increased flooding will cause more contamination of rivers and other water bodies. Due to the increased climate change, dry regions are getting drier and wet regions keep getting wetter. Houses in the Midwestern region are designed for colder temperatures. They tend to hold heat in rather than shed it. Declan, Tobin. " 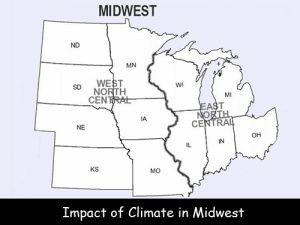 Midwest Climate Facts for Kids ." Easy Science for Kids, Apr 2019. Web. 21 Apr 2019. 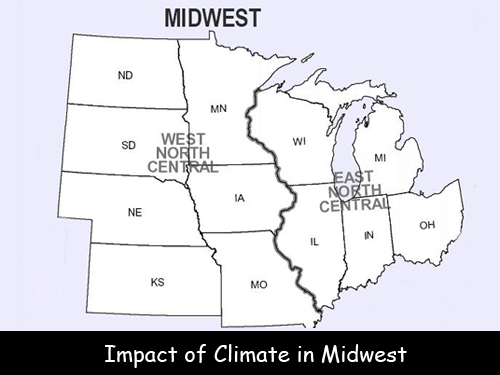 < https://easyscienceforkids.com/impact-of-climate-in-the-midwest/ >.